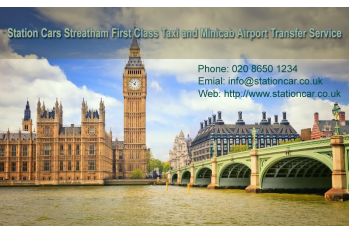 Station Cars Streatham are a reliable Taxi Minicab and Airport Transfers company. we cover a broad area within the M25 and suburbs as well. We are also available for pickups and drops to and from all of London's major airports which include Heathrow, Gatwick, Luton, Stansted and London City Airport.We also provide our services for transfers to hotels, restaurants, theaters, clubs and even hospitals and universities picking up or a takeaway. Station Cars Streatham local service area coverage includes Streatham, Norwood, Norbury, Gipsy Hill, Dulwich, Penge, Sydenham, Crystal Palace, Anerley, Lewisham, Croydon, Tulse Hill, Forest Hill, Catford, Bromley, Herne Hill, Beckenham, Selhurst Park, Tooting, Balham, Mitcham, Brixton, Thornton Heath, Clapham, Orpington, Wallington, Carshalton Beeches, Colliers Wood, Wimbledon, Surbiton, Putney, Ashtead, Belmont, Banstead, Hanworth, Whitton, Hounslow, Hinchley Wood, Feltham, Wandsworth, Long Ditton, Southwark, Hook, Claygate, Cheam, Malden Manor, Morden, Earlsfield, Hampton, Elstree, South Mimms, Shenley, Ewell, Purley, Worcester park, Stoneleigh, Motspur Park, Oakleigh Park, Epsom, Merton, Esher, Hadley Wood, Brookmans Park, St Albans, Muswell Hill, Hornsey, Scratchwood, Letchmore Heath, Finchley, Woodside Park, Winchmore Hill, Southgate, Potters Bar, Palmers Green, Monken Hadley, Mill Hill, Edgware, Crouch End, Botany Bay, Barnet, Well End, Totteridge, Whetstone, Kingston, Ham, Oakwood, Northaw, Enfield, Borehamwood, London Colney, Cockfosters, Radlett, Arkley, Thames Ditton, Crews Hill, New Malden, Berry Lands, Teddington, Raynes Park, Roehampton, Molesey, Chessington, Twickenham, Richmond, Tolworth. Keyword: Streatham Taxi, Streatham Taxis, Streatham Cab, Streatham Cabs, Streatham Minicab, Streatham Minicabs, Taxi in Streatham, Taxis in Streatham, Cab in Streatham, Cabs in Streatham, Streatham Prepaid Taxi, Minicabs in Streatham, Cheapest Streatham Taxi, Minicab in Streatham, Cheap Streatham Taxi Cabs, Lambeth Taxi Cab, Mini Cabs in Streatham Hill Station, Streatham Station Taxi, Streatham Hill Taxi, Streatham Hill Taxis, Streatham Hill Cab, Streatham Hill Cabs, Streatham Hill Minicab, Streatham Hill Mini Cabs, Streatham Hill Airport Transfers, Streatham Airport Transfers, Airport Transfer Streatham, Streatham Vale Taxi, Streatham Vale Cab, Streatham Vale Minicab, Streatham Vale Airport Transfers, Streatham Common Taxi, Streatham Common Cab, Streatham Common Minicab, Streatham Common Airport Transfers, Streatham Village Taxi, Streatham Village Cab, Streatham Village Minicab, Streatham Village Airport Transfers.